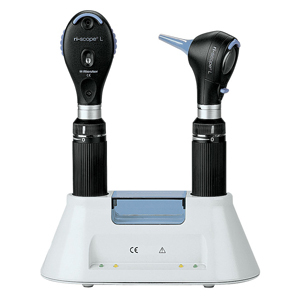 LED technology for otoscopes with low-reflection, bright and white light. The pure white light (approx. 5500K) ensures colour-neutral illumination in addition to improve colour differentiation, thereby aiding more efficient diagnosis in comparison with halogen or xenon bulbs. The LED illumination shows colours as they really are. LED technology for ophthalmoscopes with low-reflection, bright and white light. The pure white light (approx. 5500K) ensures colour-neutral illumination in addition to improve colour differentiation, thereby aiding more efficient diagnosis in comparison with halogen or xenon bulbs. The LED illumination shows colours as they really are. 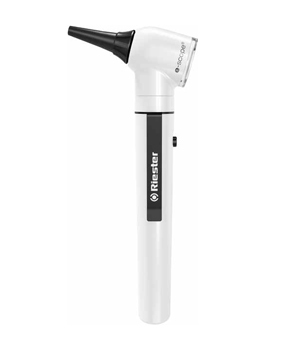 ri-scope L Otoscope with optical glass and reduced reflection. Basic model with reflection minimised direct illumination Halogen HL 2.5V or XL 3.5 V. Bi-directional swivelling optical glass with 3-fold magnification. Suitable for pneumatic tests (supplied without ball). Available with optional C or AA handles. L2 and L3 version - fibreoptic for optimal beaming and transmission of light. High-end Version L3 with operation lens with 4-fold magnification and specula ejection device. The ri-scope L ophthalmoscope's modular design impress with high-performance optics, with aspherical condenser lens and reduced reflection. 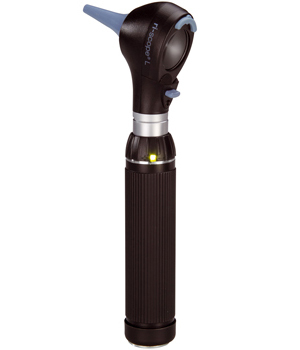 The new ri-scope L ophthalmoscopes have a thumb-rest for securing the ophthalmoscope, which enables easy control of all the elements with one finger. Reflexes from the cornea and iris are avoided by separating the observational and illuminating light beams (Gullstrands's principle). 3 different versions – L1, L2, L3 available with correction lenses with up to 89 diopter values. 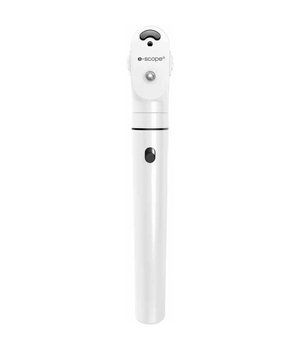 Easy to operate aperture hand-wheel for apertures and filters included in all three versions. 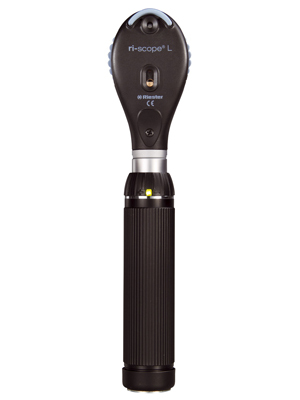 High-end version L3 includes a focussing device with zero retention for force for the quick correction of ametropias.